Chicken Sausage Stir Fry | Simple and Delicious ! Some people would discourage us from buying sausages, though we choose only chicken. They say only the 'unwanted parts' after slaughtering are used for making sausages. So we used it only once in a month but was difficult to avoid wholly since kids loved it very much. Cut onion, tomato and green chillies into very small pieces. Heat little oil , put sausages into it. 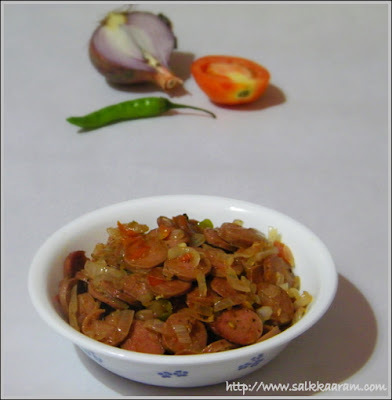 Stir slowly on a medium heat until the both sides of the sausages are cooked and turned little brown. Then put the chopped onion, tomato and green chillies into it. Stir well slowly until the onion is half cooked. Put the powders and salt (if needed). Stir and remove from fire. That's really a wonderful dish! Blog looks like a little princess!! It is simple and yet very pleasing! I love pink. And this dish is simple too... I have never used sausage, only seen in TV! Sausage stir fry that sounds really interesting... Good one!!! is it true that people says chicken saucages is made with unwanted parts of chicken. my kids never tasted any saucages after we have settled down india. my wife used to make this "stir fry" outside india and thatz some things good to cater unexpected visitors to home during lunch/dinner time. i have shown your "sausage fry" method to my grown up daughter and she is going to try out that tomorrow. we really dont know where frozen chicken sausages availale at trichur. any way thanks a lot seena for bringing our new innovations. new header pic looks nice. 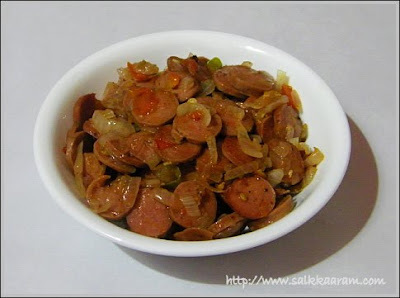 pinne sausage vachulla onnum ithu vare jaan try cheythitilla..
Hi Seena this looks really delicious. we could find frozen chicken saucage from trichur city. two brands available. my daguhter purchased two packets and made it. she said that she could remember her childhood. she used to take hotdogs and a pepsy to school. thank u seena once again for writing this beautiful article. ++ if you have time, please write about fried chicken [kentucky] and italian pizza etc. my wife used to make similar to kentucky chicken while we were at muscat. it was unbelievable! the taste was amlost same. she could achieve about 60 to 80%. we have to have chicken with skin. if you could talk to her she can give you the recepe. she never made this chicken in india. i dont know why.